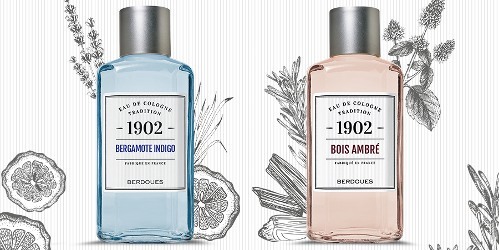 French perfume house Berdoues has launched Bergamote Indigo and Bois Ambré, two new fragrances in the brand's 1902 Tradition Eau de Cologne Collection. Bergamote Indigo ~ "This fresh, light eau de Cologne is highly addictive. The citrusy notes of the Bergamot are subtly countered by a fruity rhubarb-blackcurrant accord. Aromatic woody amber lavender extends the fragrance's sparkle." Bois Ambré ~ "An unmistakable fragrance trail for peerless elegance. This comforting Cologne, opens with fresh, citrusy notes and unfolds wafting woody, amber notes that add warmth and intensity to the fragrance." Berdoues Bergamote Indigo and Bois Ambré are available in 125 ml spray, or 245 and 480 ml splash. Oooh, these both sound lovely to me – I’d love an amber-y cologne I could wear during the very hot summers where I live. And I love bergamot as well. It’s a big collection too — never tried any of them but quite a few look tempting. This brand’s cologne collection is rather nice and very easy on the wallet. I wear and really enjoy their “Naturelle” – I have it in the 8.3 ounce size and it was less than $40 (worth mentioning: Naturelle also has a light but lovely amber accord in the base).